With the proposed transition option, the FASB is responding to concerns raised by entities, particularly those that plan to implement new systems to comply with the guidance. These entities said that the current requirement to apply the new leases standard to the comparative periods presented in the year of adoption would be more costly and complex for them to implement than the FASB initially anticipated. On March 7, 2018, the FASB approved the changes to the comparative reporting transition guidance, providing an optional transition method when adopting Topic 842. For many companies who recently implemented ASC 606 and used the modified retrospective approach had to recast their financial statements to the earliest periods presented. This meant that they had to go back two years to the earliest reporting period presented and incorporate the changes into the transition entry to retained earnings as the date of implementation. At its November 29 meeting, the FASB proposed allowing entities the option to instead apply the provisions of the new leases guidance at the effective date (e.g., January 1, 2019), without adjusting the comparative periods presented. In the case of the adoption of ASC 842, if companies were to adopt on 1/1/2019, that means that companies would have to recast fiscal years 2017 and 2018 for the adoption of ASC 842. For example, a calendar-year entity that adopts the standard on 1 January 2019 and presents two years of comparative financial statements applies the transition provisions on 1 January 2017 (i.e., the beginning of the earliest comparative period presented). Under the proposed transition method, the entity would apply the transition provisions on 1 January 2019 (i.e., the effective date). Under the proposed new method for transition, companies will be allowed to continue using and presenting operating leasing under ASC 840 and then prospectively adopt ASC 842 on 1/1/2019. The proposal could simplify transition to the new guidance. For example, a lessee would not have to measure and recognize leases that expired prior to the effective date or consider the effects of each modification for leases that were modified more than once during the comparative period presented. Under the proposed transition method, entities could opt to continue to apply the legacy guidance in ASC 840, Leases, including its disclosure requirements, in the comparative periods presented in the year they adopt the new leases standard. Entities that elect this option would still adopt the new leases standard using a modified retrospective transition method, but they would recognize a cumulative-effect adjustment to the opening balance of retained earnings in the period of adoption rather than in the earliest period presented. Entities would still be required to apply different recognition and measurement requirements in the post-adoption period to leases they entered before adoption and those they enter after adoption. In addition to the optional relief proposed by the FASB, there was already the “group of three” practical expedients that was previously proposed and approved. 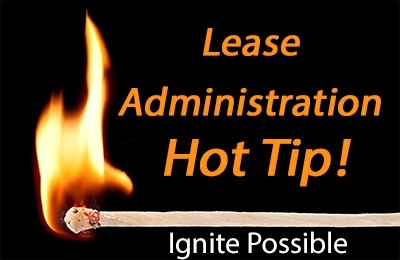 The practical expedients apply to all leases in place at the time of transition. However, the practical expedients must be applied as a package. An entity need not reassess whether any expired or existing contracts are or contain leases. 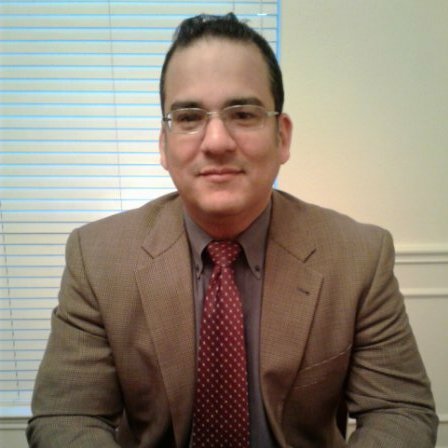 An entity need not reassess the lease classification for any expired or existing leases (that is, all existing leases that were classified as operating leases in accordance with Topic 840 will be classified as operating leases, and all existing leases that were classified as capital leases in accordance with Topic 840 will be classified as finance leases). An entity also may elect a practical expedient, which must be applied consistently by an entity to all its leases (including those for which the entity is a lessee or a lessor) to use hindsight in determining the lease term (that is, when considering lessee options to extend or terminate the lease and to purchase the underlying asset) and in assessing impairment of the entity’s right-of-use assets. This practical expedient may be elected separately or in conjunction with the practical expedients noted above. 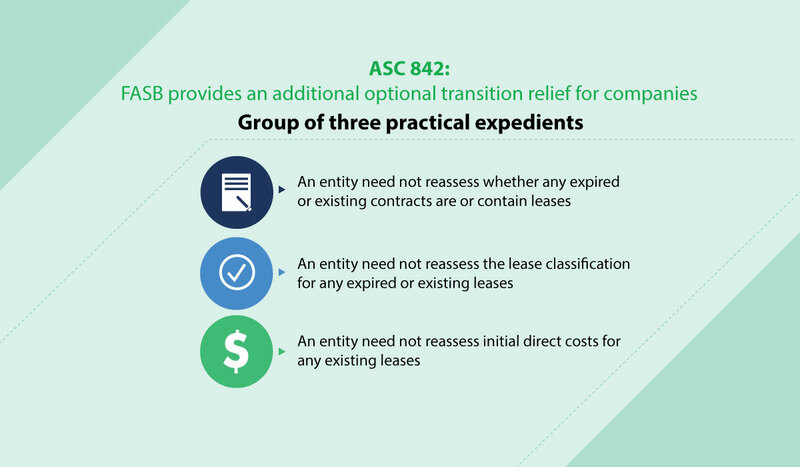 By the additional optional transition method as well as the practical expedients, companies are being provided with significant relief for the adoption of ASC 842. However, companies that rely extensively on leases for operating assets, the transition is likely to be labor intensive even when applying the practical expedients.